Thornfinn is a viking in the viking village of Indgar. Although he is the chief's son, everybody thinks there is something wrong with Thorfinn. He is nice, polite, and well mannered. He have earned himself the name of "Thorfinn the Very-very-nice-indeed". His behavior is absolutely unacceptable for a viking. When the time for the International Gruesome Games comes, and all the competitors from Indgar happen to be incapable for the competition, it is up to Thorfinn to win and bring Sword-Blunter, the ceremonial shield, back to the village. The shield is meant to be with Whirlwind, the ceremonial sword, which was lost in previous games to Magnus, chief of a neighboring village. But would be Thorfinn able to fight all these ruthless barbarians? 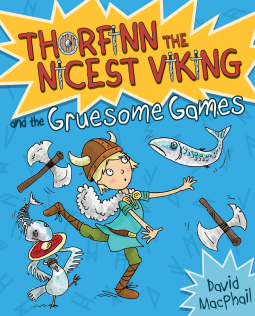 Thorfinn and the Gruesome Game is an amusing middle grade novel about how being nice and amicable is always a win. The characters are enjoyable. Velda, the energetic girl who wants to help bring Thorfinn's inner fury out, is just unforgettable. The illustrations are funny, and a great complement to the story. I see great potential in this series.